So I realized I need to be a little more on the ball about putting up these posts. Seriously I have tons of great manicures to share, but I haven't put up the posts because it's a bit more time consuming than just throwing them up to my Instagram. However, since I love my blog and all my followers I definitely need to keep doing that :) So let me share one with you today that is a bit old, but still fabulous! 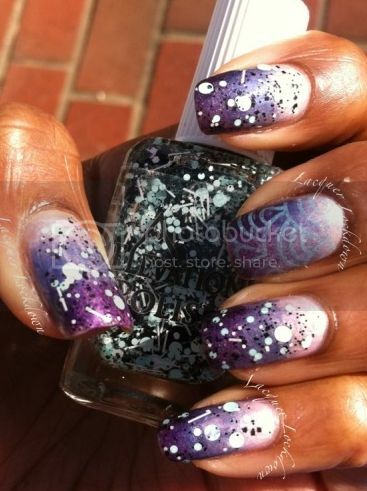 As you know I've been putting up a lot of my nail art March challenges and the 3rd one was gradients. Around here y'all know I love me a gradient. Never met one I didn't like and I've got about 3 techniques under my belt for creating the perfect one ;) I really wanted to feature a One-Of-A-Kind Elevation Polish I got too a few restocks ago. It's one of those "black & white" toppers but in the EP spirit it's blue, white, and black. Think frosts on top of mountains and you'll get it. Anyway I'll let the pictures do the talking! Friggin gorgeous right?!? Okay no seriously what do you think? The blue was a bit hard to capture due to the lightness but I love love love this combo plus I love love love this glitter topper! It's an OOK (I know don't groan it's really hard for me to get OOKs too!) but here's some good news. The brilliant Lulu of Elevation Polish was actually test running this pretty baby and released the final version on the 7th of this month. It's called Haba Xueshan and you can get it on the 22nd of March on the EP website. And before you ask, yes, I did get the final version because I want to do a comparison ;) I believe that's called being a helpless addict. In any case I remember some time ago when Lulu was planning a brown/white/black combo that was supposed to be in this vein - I want that one too! Your gradients are really pretty! I love them with the addition of black and white glitter on top! Gradients are probably one of my all-time favorite looks, and it is nice to see one topped with something other than China Glaze Fairy Dust for a change! 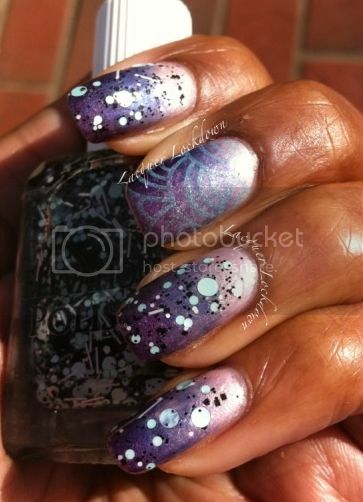 Bestie Twin Nails - Blasian Color Nation!